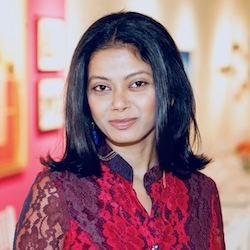 Grace Aneiza Ali, Visual Arts | Mayapple Center for the Arts and Humanities, Inc.
Grace Aneiza Ali is an Assistant Professor and Provost Faculty Fellow in the Department of Art & Public Policy at the Tisch School of the Arts, New York University, and a Curator and Editor. Ali’s curatorial research practice and exhibitions chiefly focus on socially engaged global art practices as well as on contemporary art of the Caribbean and its diaspora, with a focus on her homeland Guyana. She is the founder and curator of Guyana Modern, an online platform for the contemporary arts and culture of Guyana and its diaspora. As an Editor, she is the founder and editorial director of OF NOTE Magazine — an award-winning nonprofit arts journalism initiative reporting on the intersection of art and politics and global arts activism.